TOKYO, Japan (CNN) -- Japan has released a slew of economic data that paints a picture of a nation struggling amid the global economic slowdown. 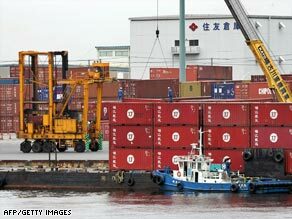 Japan's exports plunged 45.7 percent last month, as major exporters made further production cutbacks. The world's second-largest economy reported a drop of 10 percent in industrial output for January, compared with a year ago. The fall in industrial output is a record drop for the country, the government said. Industrial output reflects how much Japanese companies produce. Exporters have cut production sharply as world demand has slumped. Exports plunged an unprecedented 45.7 percent last month, as major exporters such as Toyota and Nissan announced further production cutbacks. Falling global demand for Japan's cars and electronics has led to increased unemployment. The government did report unemployment improved slightly for January, falling to 4.1 percent, versus December's 4.3 percent. But Credit Suisse economist Satoru Ogasawara called that report "a mystery." "I don't understand it," Ogasawara said. "How I see this is that jobless people are simply giving up looking for new work. I'm sure this figure doesn't mean employment is improving." Economist Richard Jerram at Macquarie Capital Securities also said the unemployment figure is "not reliable." He points to the ratio of jobs available to each applicant, which the government says stands at 0.67 for each job seeker. That is the 12th straight monthly decline. That indicates companies are reluctant to hire, offering fewer and fewer jobs to a growing pool of unemployed, Jerram said. The only bright news came in the key consumer inflation rate, which was unchanged in January compared with a year ago.